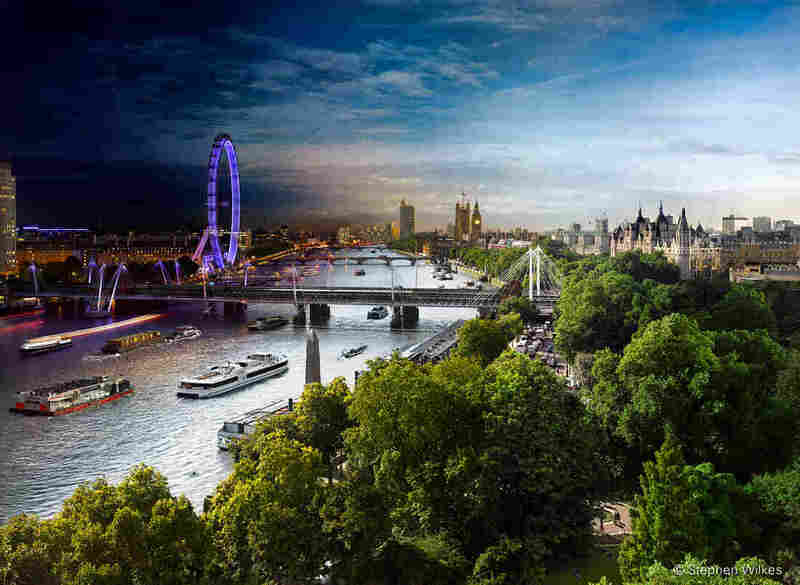 'When People Can See Time': Photographer Stephen Wilkes Captures Day, Night In One Image : All Tech Considered Photographer Stephen Wilkes describes himself as a "collector of magical moments." He composites dozens of photos to show the changes one place undergoes from sunrise to deep into the night. Of all of the arts, photography may be the discipline most accustomed to the nudge of technology, and photographer and artist Stephen Wilkes fully embraces the challenge. 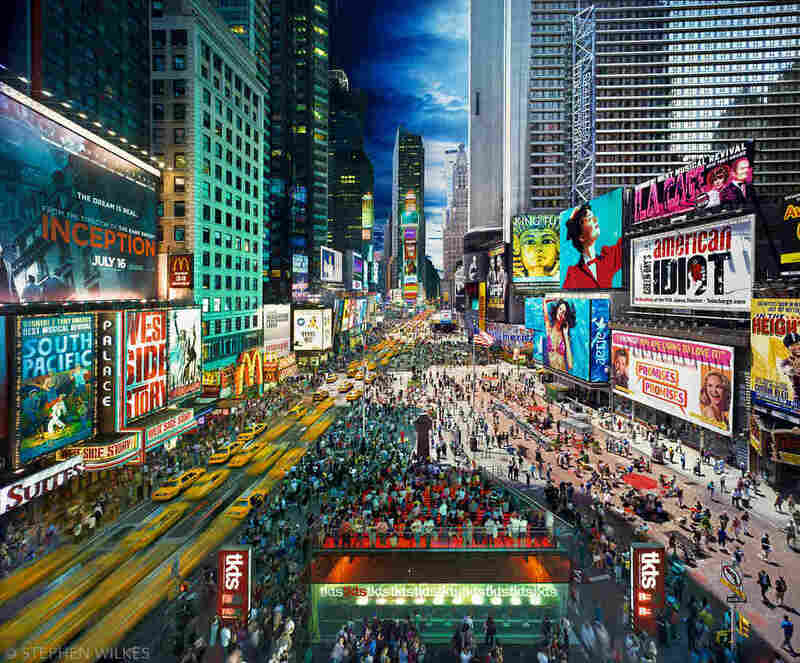 His latest project, "Day to Night," takes on the idea of showcasing, in one composite still image, the transformation of a place over the course of a day. Take his photo of Serengeti National Park in Tanzania. 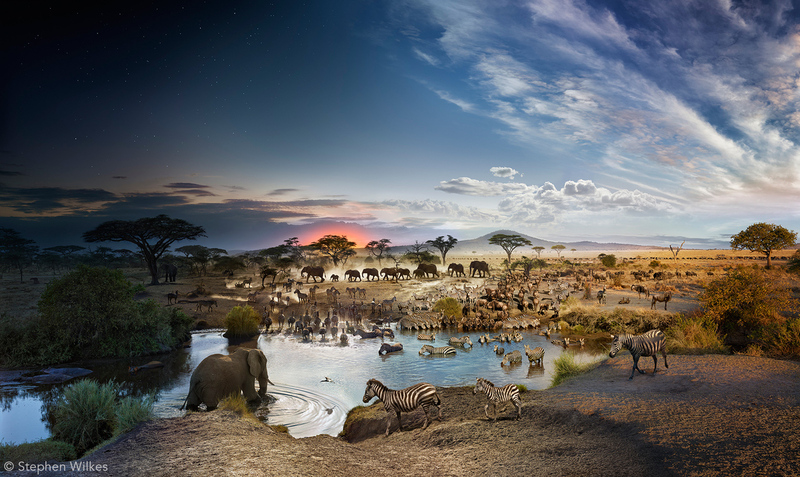 For 26 hours, Wilkes shot 2,200 photos without moving the camera and while suspended in the air in a tent-like structure with a little window, so that animals wouldn't see or hear him as he photographed them coming to a watering hole from sunrise to deep into the night. "I photograph by hand; this is not a time lapse. ... It's my eye seeing very specific moments," Wilkes says. "I like to describe myself as a collector of magical moments." Once Wilkes has all the images, he picks the best moments of the day and the night and creates what he calls a master plate. Those images then get seamlessly blended into one single photograph, where time is on a diagonal vector, with sunrise beginning in the bottom right-hand corner. That process of creating a single image can take about four months — though it's photographed in a single day. I spoke with Wilkes in Vancouver, ahead of his TED talk, about the powers of digital photography, the experience of looking in the face of time and the challenge of sharing emotion through an image. Below are some of the highlights of our conversation. I'm changing time within the picture. As the sun is rotating, light is changing and all these animals, you can see time change on the light in the animals. It's all based on time. ... (At) sunrise you begin to see the watering hole is quiet and the animals migrate in as the sun rises. Wildebeests and zebras graze together; one has terrible eyes and the other has lousy hearing — the blind leading the deaf. There are meerkats. It was like watching the movie Jungle Book. As time is changing, you see the sun getting higher, you see the light begins to rotate and starts to go behind the animals. I'm watching them. Guess who else is watching them? A lion. They have this whole process of coming in and going out, it's a rhythm. I'm telling the story based on time. It's such a complicated process and yet there's so much luck involved. I discovered digital in 2000 and started to realize, because I had to come through the process of analog ... I wanted to push the medium outward. So what I've been exploring is this concept of day-to-night, where I change time within a photograph. I'm really exploring the space-time continuum within a two-dimensional photograph. And it's really cool because I can tell stories that photographs could never tell before. Compressing an entire day into a single image, the best moments, allows me to share things on a narrative level that you just couldn't see. The most exciting part of it really is how people respond to the work. It's an amazing, emotional thing. When people can see time, the face of time in a way, it's this thing we can never put our hands around. But yet, when you look at it, it makes you feel a different way and there's an emotional thing that happens and that's exciting. I just think it's the best time to be alive as a photographer, really. I think as technology keeps evolving the things you could only imagine or dream are at your fingertips now. It's just about where you want to go. When you can capture an image on a silicon chip versus a piece of film you can see it instantly, that's the first thing. For me, when I do one of my photographs, I can shoot 2,500 images in a single day. Now, if I was doing that with an 8x10 camera, which is the image quality I have in my digital back*, that would be 2,500 sheets of 8x10 film. It would be impossible to do what I'm doing, just the visualization of that would be impossible — and financially, to boot. And my assistant would probably jump out of the cherry picker! *Editor's Note: A digital back is a piece of equipment you can add to the back of a film camera to modify it to take digital images. So if I'm a storyteller, I love that, suddenly things that were insignificant are really significant now. And that's the power of what's happening now. Eventually photography is going to look like a window; you're going to have a visceral experience with my pictures on the wall. Because the way you'll see into my pictures is almost the way the eye sees, and that's the way it's going. For me, I want you to feel the way I felt when I stood there and took the picture. I work with a master printer in New York and I actually print on conventional photographic paper because of the depth perception. I really want to enhance that, but there are so many new technologies that are coming out in terms of 3-D printing and all kinds of different things. Who knows where we're going to be five, 10, 15 years from now based on what's happening and the speed of what's happening.